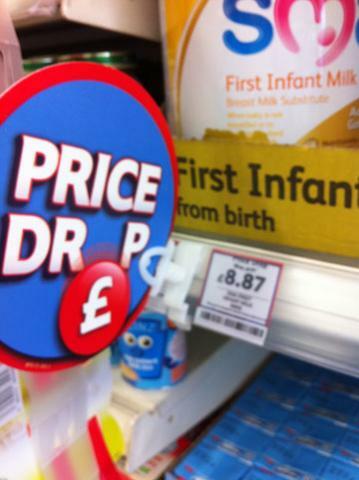 Tesco has pulled a ‘Price Drop’ promotion for infant formula from stores across the country following a complaint from the campaign group Baby Milk Action, which contacted the company and Trading Standards on behalf of the Baby Feeding Law Group (BFLG). The promotion, which included prominent ‘Price Drop’ point-of-sale promotion and price reductions, is illegal under the Infant Formula and Follow-on Formula Regulations. Tesco claimed that infant formula had been included in the promotion accidently. It said it had made a similar mistake on its website, which it claims it has also corrected. BFLG consists of 23 leading health worker and mother support groups working for UK legislation to be brought into line with international standards. Violations of the Code and Resolutions have been described as “commonplace” in the UK by the United Nations Committee on the Rights of the Child, which has called on the Government to fully implement these measures in legislation. In March 2011 the coalition government instead scrapped the Infant Feeding Coordinator posts in the Department of Health and government support for National Breastfeeding Week. BFLG is promoting an ePetition campaign calling for a Parliamentary debate.